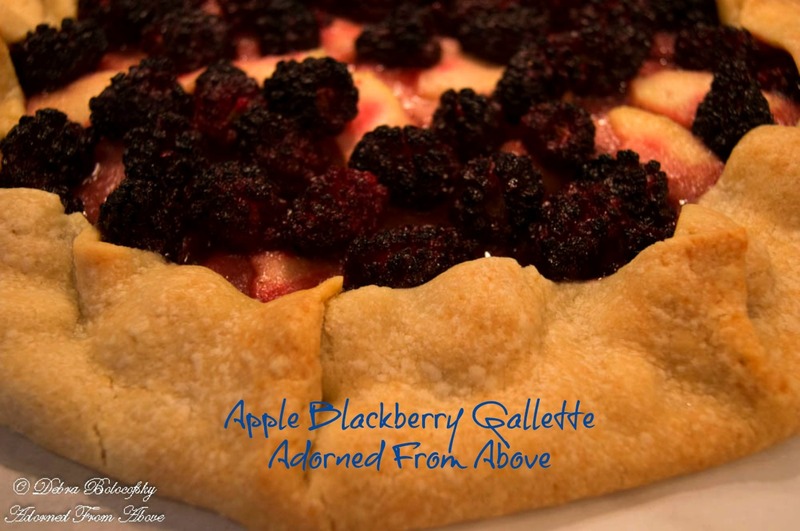 I joined Weight Watchers two weeks ago and I decided to make this delicious Apple Blackberry Gallette. Yum! It was delicious and super easy to make. I always like easy recipes. I adapted this recipe from a Weight Watchers recipe for a Pear Blackberry Gallette. I didn't have any pears on hand, but I had lots of apples. I took this to my cousin's house for dessert and was so excited to share it with everyone. It is such a simple, rustic, looking kind of dessert. Just so beautiful. It looks like something that would have been made for dessert after a long day working on the farm or ranch. That thought makes me feel all warm and fuzzy inside. There is something so comforting about connecting with our roots through food. Anyway, I never took the pictures yesterday, so I made another one today to share with all of you. Only this time I made it without sugar and used my Sugar Free Sweetener - CopyCat Gentle Sweet, and that was just as delicious as the first Gallette with sugar. 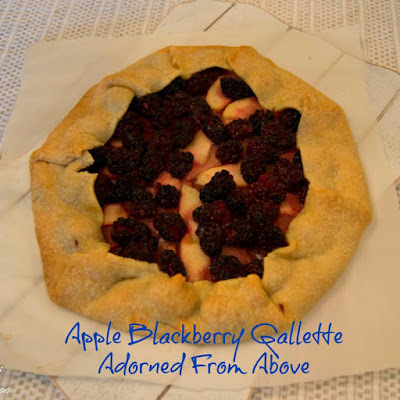 So today you have a recipe for the Apple Blackberry Gallette with or without sugar. The one with sugar is 7 points and the gallette without sugar is 5 points. You get to choose. You could also substitute Splenda, stevia, or Swerve confectioners also for the Copycat Gentle Sweet. Now, I want to share why I joined Weight Watchers. I am not an affiliate right now, though I have signed up for their affiliate program. I have done every kind of diet on record, only to gain the weight back and even more. I was hesitant to share my journey, because a lot of people who follow my blog are also friends, and it makes me feel bad about myself that I can not keep the weight off. Not only keep the weight off, but to gain even more, is even more difficult to share with people. I have even done Weight Watchers in the past, only to gain the weight back again. I have been on a Ketogenic diet for the past year for health reasons and those issues were taken care of by the Keto Diet. I have done low carb diets, counted calories, the Atkins Diet, The Scarsdale Diet, The Palm Beach Diet, lots that I no longer remember. I joined a health club a few months ago, so I had already started exercising several times a week, but I knew that I needed something to help me with weight loss. Enter, Weight Watchers! The reason that I am sharing this with all of you now, is that I decided to be transparent about what I am doing in hopes that it may help someone else. To help someone like me to feel better about themselves. You are beautiful and your worth is not in how you look or how much you weigh but the kind of person you are. I am telling you right now that no matter your weight, you need to love yourself. For me, it is trying to see myself the way God sees me, and I know He sees a beautiful woman. I had been thinking about this for several months and kept seeing Oprah in the WW commercials and decided to bite the bullet and join Weight Watchers again. It has been even easier this time to start it. I can eat anything, I just need to count my points. Some of the things that I had really missed were pastries and breads. I can eat these now, but again I have to count my points and make decisions about what I really want to eat, and what will I give up to have it. I had pizza and garlic knots last week and it was delicious and worth every point. What did I give up to have it, nothing really. I had egg whites scrambled for breakfast, Trader Joe's Veggie Flaxseed tortilla chips for lunch, and for dinner and antipasto salad, 2 pieces of pizza, and 2 garlic knots. All of that came to 32 points. I get 30 points in a day and 35 extra points in a week, so I used 2 of my extra points for that day and it was worth it. I also had a couple of apples for snacks that day, and they are 0 points. Normally, my meals are a healthier then this, but this was exciting. I didn't feel like I was cheating or doing something wrong, I am allowed to eat this. It is a novel thought for me after years of not eating things because they are not allowed. I guess that always set me up to fail. Anyway, I lost 5.6 pounds in the first 12 days and that makes me happy! I have a long way to go, but this is a good start. 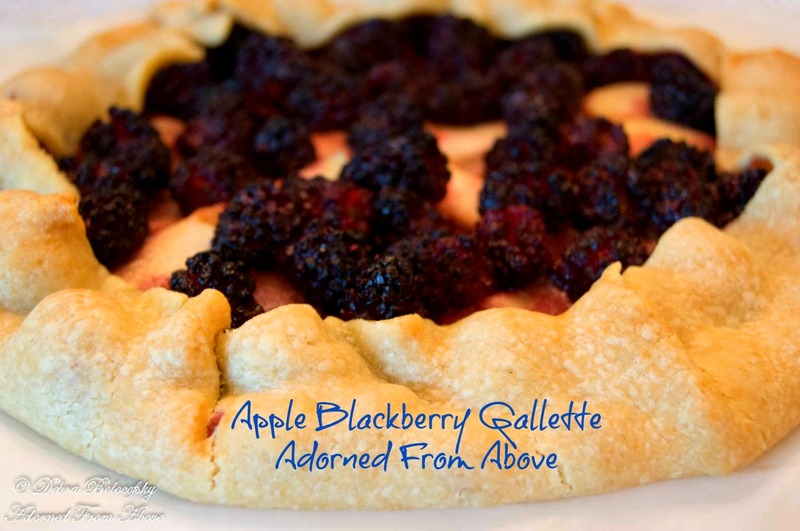 Anyway, on to the recipe for this delicious Apple Blackberry Gallette. Put you apples and blackberries in a bowl and add the butter, salt, and sweetener and stir together. Next, fold the pie crust over the edge of the apples and blackberries. Bake for 45 to 55 minutes, until the crust is done and lightly browned. I hope you like this recipe. As always I love hearing from all of you, and if you have any questions please feel free to send me a message.